There were 21 homes sales in the Piney Orchard community this month which is a slight decrease over the same period last year. New listings were up slightly with new pending and sold listings down which lead to a slight inventory increase. 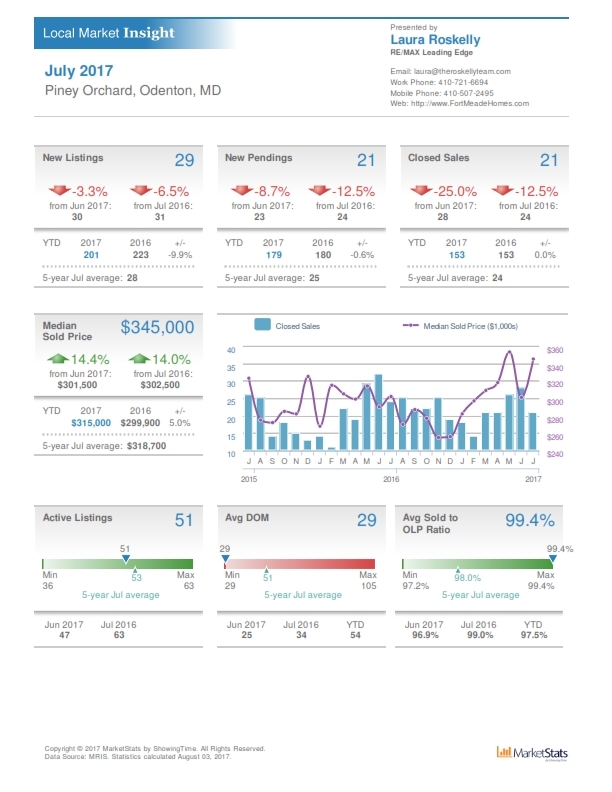 Average days on market was down with well prepared and marketed homes being absorbed quickly. Most notably, the average list price to sale price was at 99.4% which is indicative of the multiple offers we were seeing on the best homes. If you're thinking of selling your Piney Orchard home, start with a free market value analysis and contact us for information on our time tested marketing plan. We offer free home staging and professional photography to make sure your home receives exposure to the widest audience of home buyers. Thinking of buying or renting in Piney Orchard? We make it easy to search the latest listings. The Roskelly Team has been selling Piney Orchard since 2000 and we've helped hundreds of families buy, sell and rent in the community. When it's time to make a move contact us and we'll make sure you get the best price and contract terms on your home sale or purchase.